I have been having so much fun playing with braids lately! I tried this side dutch braid for the first time the other day and it turned out pretty good. I didn't follow a tutorial or anything, but kind of just made it up as I went along. I will say that it was kind of one-sided, but it still looked okay. I do get a lot of my inspiration from Amber who blogs at Barefoot Blonde though. 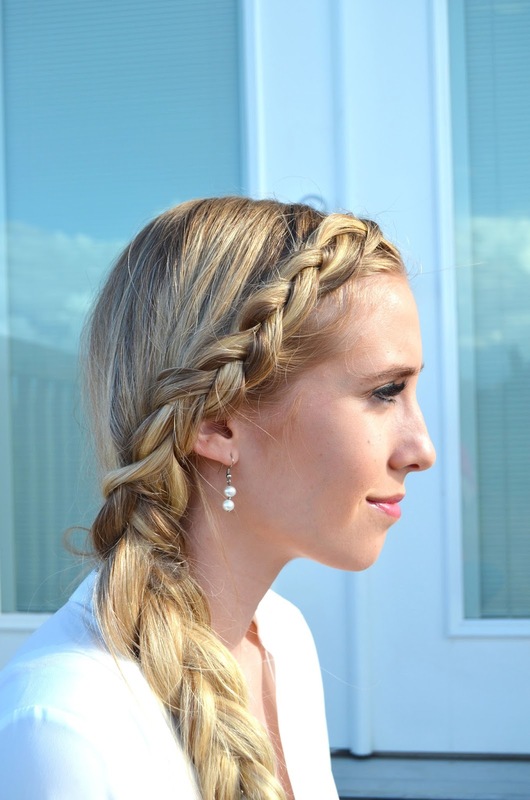 She is amazing and has so many excellent braid tutorials that I have used in the past. Rosalie wanted to be right up in the action when I was getting ready so she ended up stepping on me to look in the mirror (it was floor length mirror on the floor) I don't know how many times, putting concealer on her lips, and using my blush brush to put on her "makeup". It was probably the cutest thing I have ever seen! :) This was the night of our Anniversary, and Chanse and I had fun going to dinner with just the two of us. We aren't really celebrating until this weekend, but we had so much fun just talking over dinner. I sure love my sweet husband! Love the braid! Looks lovely. Love the braid! And I love Barefoot Blonde too, she seriously has some amazing hair tutorials! Love your hairstyle...wish I could do it like that! Love the hair! 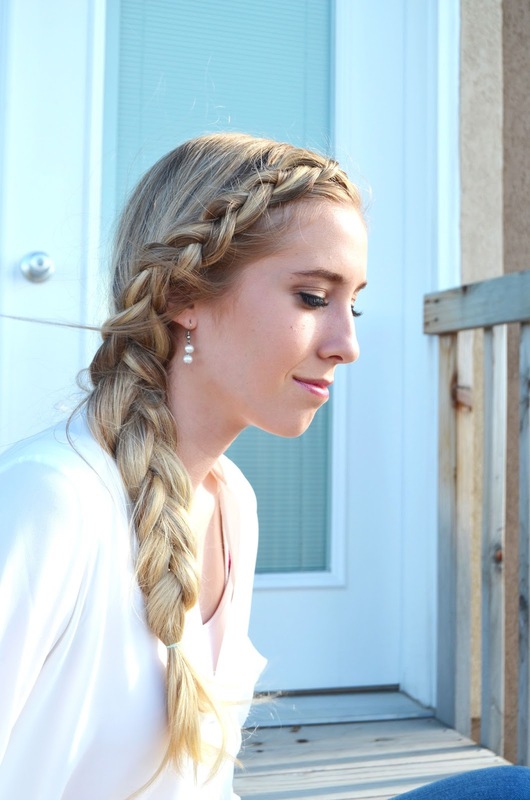 I just published a post about favorite braid tutorials myself. 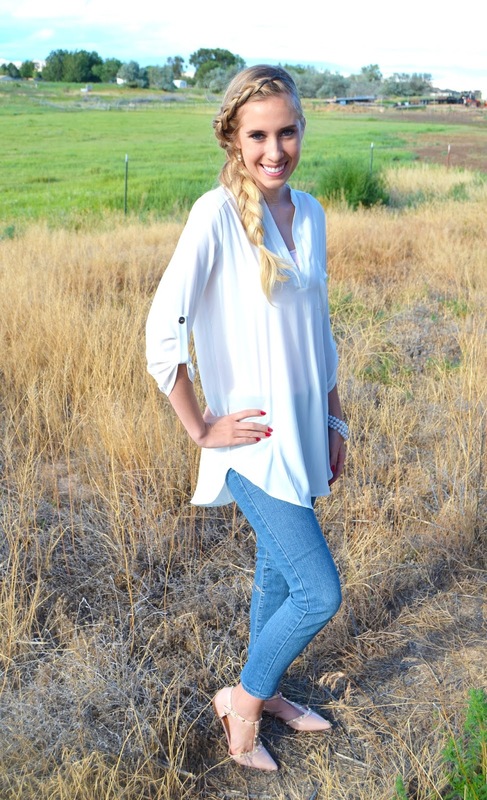 This look is so simple but you did an amazing job making it your own with the chic braids and the studded flats! Adorable! You did an awesome job, I think it looks amazing and adds character to your outfit shots. LOVING the braid! My hair is short so I'm limited with what I can do with it, but I'm always so impressed when people can master braided styles!